Quick and easy dish to cook. 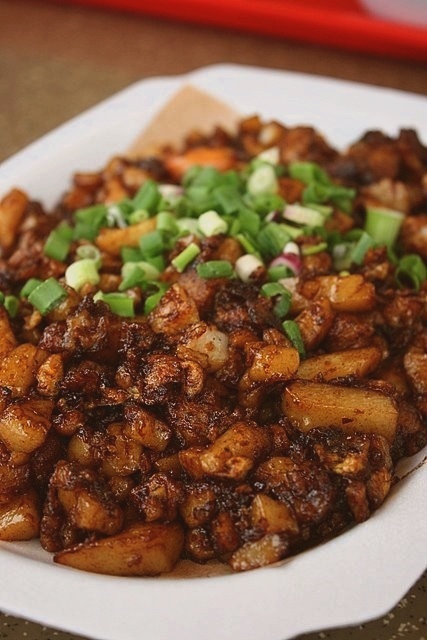 Carrot cake, or commonly known as "chai tao kway", is another popular local cuisine well-liked by many Singaporeans. This dish can be found in most hawker centres which is eaten for breakfast and supper. It is made with steamed rice flour and white radish, fried with egg, garnished with spring onions and fresh coriander leaves. Chilli addicts typically request a dash of chilli paste to be added to the mix too! Heat 2 tablespoons of oil in a wok. When the oil starts to splatter, throw in the radish flour cakes, use the spatula to cut the flour cakes into small cubes. Put the pieces aside and add in another tablespoon of oil, add in garlic and chye poh till both brown to give fragance. Mix it with the radish cakes pieces evenly and make a space again. Break the eggs and leave it to set for a few minutes. Push the radish cakes on top of it again and toss. Add in fish sauce and chili paste and stir even more evenly. Add in dark soy sauce if preferred or else serve hot with chopped spring onions and fresh coriander leaves as garnish. The key to goodness for a good plate of carrot cake is to ensure all the flour cakes get an even heat, only then will the carrot cake taste nice.